April vacation will begin for RHS students today at 2:35 p.m. After a long March of cold, rainy weather, students are probably looking forward to getting some rest and relaxation and maybe even some sun on their nine days off. Some students like junior Phil Pattison are heading south to get some sun. “I’m going down to Florida with my family,” he said. He will be visiting Disney World in Orlando. Most however, will be staying relatively close to home and doing some things that they don’t get to do while going to school. Our principal, Mr. Harrison says that he will be celebrating his daughter, Peyton’s first birthday! Happy Birthday to Peyton! 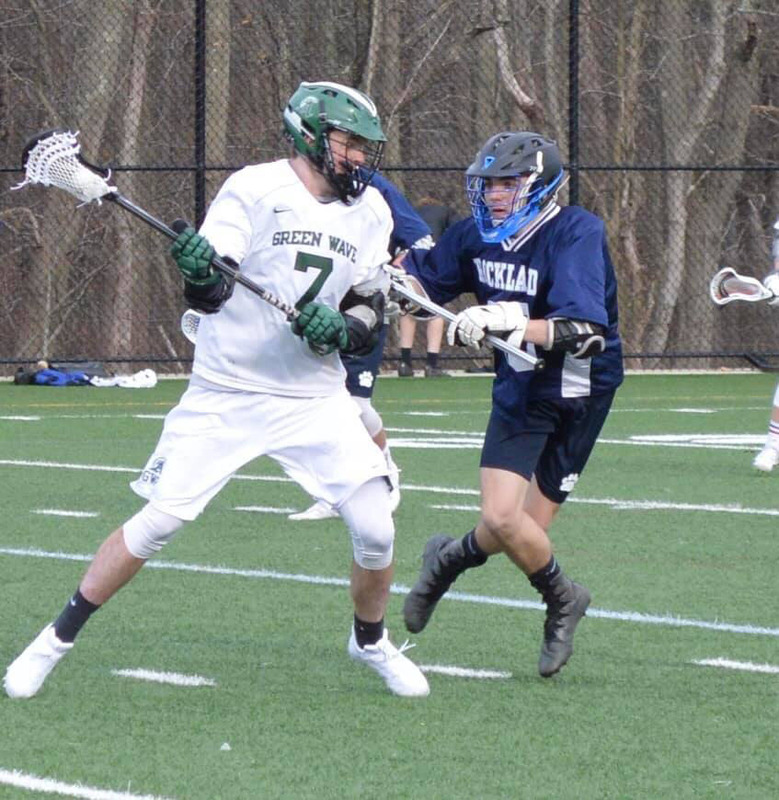 The RHS girls lacrosse team will be going to Bentley University in Waltham to watch the Bentley Falcons play against Merrimack. The RHS baseball team is playing a doubleheader on Tuesday, April 16 against Hanover in Rockland. All the other teams will be getting back to playing games after vacation. Some students will be using the extra time to catch up on school work as well as sleep. Senior Rebecca Mullen says she’ll be “sleeping, working on psych essays, working a little, but mainly sleeping”. Thirty-four RHS juniors and seniors along with three chaperones will be going with the Travel Club on their long-awaited trip to Europe. One of those is senior Bonnie Gasdia who is excited, she said, to visit Germany where her family is from. Those RHS students like sophomore Becca Killion who say they are doing “nothing” might want to take an opportunity to get some community service hours at the annual Rockland Clean-Up Day to be held on Saturday, April 20 from 10 a.m. to 12 at the Town Hall. 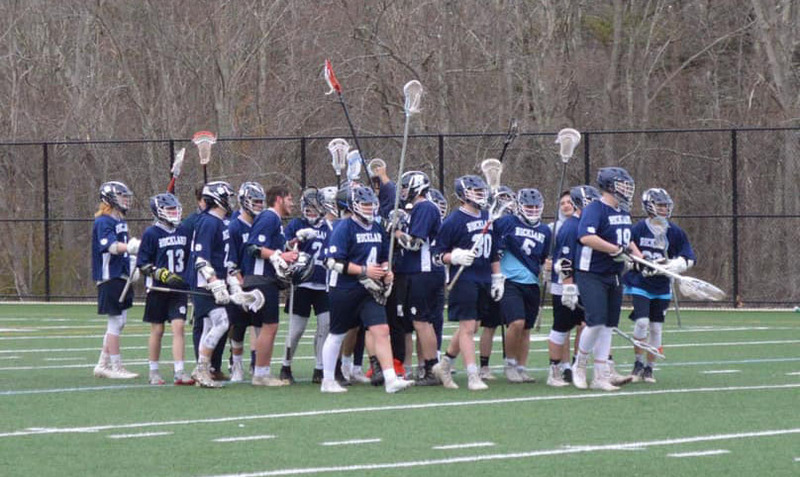 Some RHS teams like the lacrosse team participated last year but anyone can sign-up to do it. You can sign up by contacting REiMAGINE ROCKLAND at reimaginerockland@gmail.com for information regarding volunteer opportunities. Details of the event are available online at www.rockland-ma.gov and www.facebook.com/REiMAGINEROCKLAND. When seniors get back to school on April 22, they will have only 22 more school days to get through and the underclassmen won’t be far behind! At the start of April vacation, 34 RHS juniors and seniors are venturing abroad with the RHS Travel Club. For most of the kids going, this trip has been 2-4 years in the making and after many payments and fundraisers has become a reality. On Saturday, April 13 the students will be loading onto a bus with chaperones English teacher Kristen Walsh, science department head, Samantha Hoyo, and science teacher Julia DiCanzio. From there, they will ride the bus to Logan International Airport, make it through security, and spend nearly 14 hours in and out of airports and the air before they reach their first travel spot in Vienna, Austria. In Vienna, some of the main attractions they’ll see through tours are the Hofsburg Palace and the Parliament Building. After two nights in Vienna they’ll travel by bus to Prague, Czech Republic. Picture of the Hofburg Palace, Vienna. In Prague, the group will visit St. Vitus Cathedral, the Charles Bridge, and other historic and cultural locations. After spending two nights in Prague, the group will wake up and travel by bus to Munich and Dachau, Germany. In Germany, among the sites they will visit are the Dachau Concentration Camp Memorial Site, and the Munich Olympic Stadium. The students had the option to pay an additional fee to visit the Neuschwanstein Castle. On Day 8 of the trip, they will travel from Munich to Zurich, Switzerland. Picture of the option Neuschwanstein Castle in Germany. There, they’ll take a walking tour of Zurich’s Old Town and visit a local business. On Day 10, the group will head home. View of Zurich’s Old Town in Switzerland. Their exhausting return flight is scheduled to land in Boston’s Logan Airport at 9:03pm and all students and staff on the trip are required to report to school Tuesday, April 23 after their long, fun-filled April break. Mikayla Andre and Sadie at Saturday matinee performance of Annie. For more photos from the show, go to our Photo Gallery page. The director of the play, high school and middle school chorus director, Victoria McComb, and asst. director, RPS elementary music teacher, Michelle Booth, who choreographed the dance numbers and coached the singers, got the most out of their diverse and talented cast. The cast included: Mikayla Andre (Annie); Jordan Cunningham (Warbucks); Emily Gaboriault (Miss Hannigan); Bonnie Gasdia (Grace Farrell); Olivia Janis (Lily, Lt. Ward)); Neleh Dunn (Rooster). Also in the cast were Terell Wright (Bundles, Drake, Announcer), Leah Drago (Perkins, Apple Seller, Mrs. Pugh), Kerin Dalton (Dog Catcher, Morganthau, Boylan Sister), Julia Yeadon (Ickes, Asst. Dog Catcher, Boylan Sister, Star to Be), Leah Leonard (Annette, Kaltenborn, Boylan Sister), Jonah Pishkin (Roosevelt), Hannah Ivil (Homeless Person), Callie Gillan (Cecile, Orphan), Phil Pattison (Bert Healy), Morgan Wahlstrom (Judge), McKenna Maher (Pepper), Liliana Berquist/Kelly Hamilton (Tessie), Emily Gillooly (Molly), Anabelle MacDonald (July), Kyara Williams (Duffy), Emily Holbrook (Kate), Kelly Hamilton (Orphan) and the lovable, Sadie (Sandy). The N.Y.C Ensemble included: Shylyn Boulter, Saige Clauss, Victoria Foley, Lindsay Gillan, Mary Kippenhan, Kaitlyn Kulikowski, Aleah Meade, Corinne Medford, Matthew Medford, Ngan Nguyen, Hailey O’Brien, Helana Plouffe, Rose Ripley, Ana Clara-Santos, Cailin Sullivan, Anya Voci and Morgan Wahlstrom. Before the show, Rockland Music Department Head John Piazza thanked everyone for their part in pulling the show together, including parents, teachers and students who contributed behind the scenes, and including those who played in the orchestra. Seniors involved in the musical, Bonnie Gasdia, Morgan Wahlstrom and Leah Drago, had two highly emotional nights as their last play concluded. They can all surely agree they ended their dramatic careers at RHS on a high note. Gasdia, who played Warbucks’ secretary, Grace Farrell, said that this was her favorite role. From left: Bonnie Gasdia, Mikayla Andre, Emily Gaboriault, Emily Gillooly, Anabelle MacDonald and McKenna Maher. Veritas photo. For more photos see below or go to the Photo Gallery. In front of New York City background. “Easy Street” performed by Olivia Janis (Lily), Nelah Dunn (Rooster) and Emily Gaboriault (Miss Hannigan). The final gathering of the 2018-2019 Student Council year took place as the 2019-2020 year was kicked off yesterday on Wednesday, April 3 at Pembroke High School. Nine of Rockland’s Student Government Council attended the annual Spring SEMASC Conference. Here, the 2018-2019 year was put to bed while the 2019-2020 year was kicked off and celebrated. The upcoming year’s delegates, vice president, and secretary all presented speeches, were voted upon, and were announced. Workshops also took place and the seniors were given recognition of their graduation from 4 years of SEMASC. Amongst the seven delegates one came from Rockland to better impact our region. Sophomore Greta Russo campaigned with her theme of “The Garden of Leadership” and after giving her speech was elected one out of the three delegate positions on the 2019-2020 SEMASC Executive Board. Along with celebrating Russo’s victory, SEMASC’s 2019-2020 president and Rockland’s own junior Jacob Leahy was passed the gavel yesterday marking the start of his time as SEMASC president. At the very end of the conference, seniors from across the 36 SEMASC-participating schools were acknowledged for their commitment to Student Council and their participation in these conferences for the past four years. This weekend the RHS Music Department welcomes you to come and watch the spring musical production of Annie. For months, many RHS students have been rehearsing tirelessly for the show. The musical will debut on Friday, April 5 at 7 p.m. A second show will be put on the the following day, Saturday, April 6 at 1 p.m. The show will take place in the RMS/RHS auditorium. Starring in the play is freshman Mikayla Andre as Annie and junior Jordan Cunningham as Oliver “Daddy” Warbucks. Additionally, senior Bonnie Gasdia will play Grace Farrell and sophomore Emily Gaboriault takes the role of Miss Hannigan. 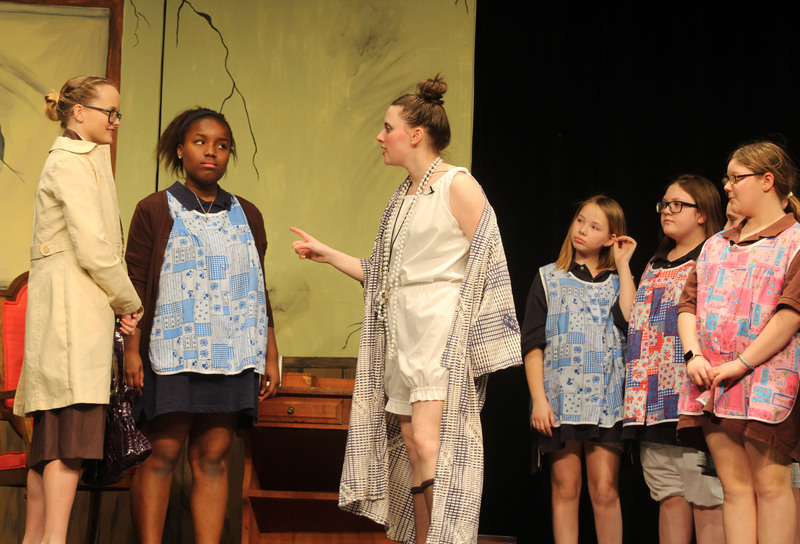 The show also features junior Neleh Dunn as “Rooster” Hannigan and junior Olivia Janis as Lily. The girls from the orphanage will be played by several middle school students. The show is directed by RPS teachers Victoria McComb and Michelle Booth. 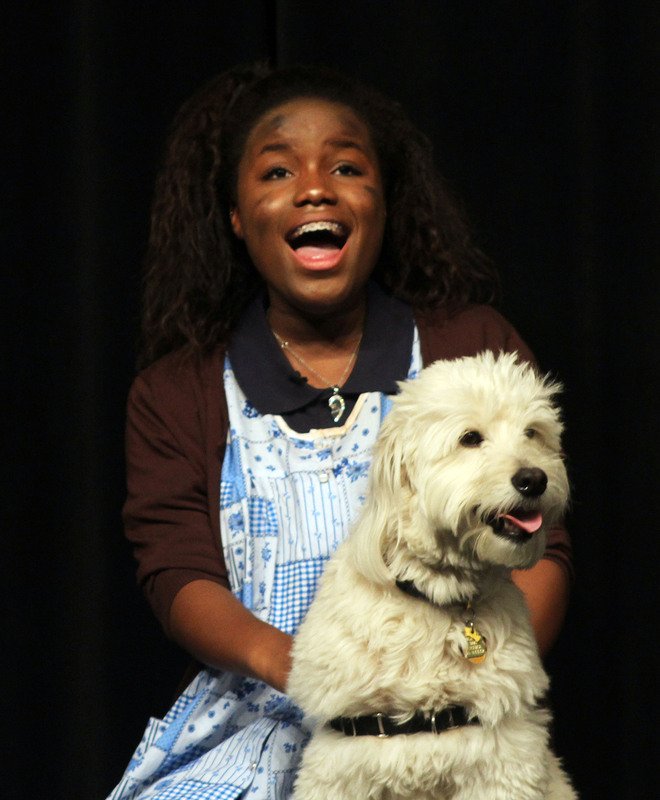 A complete cast list will be available tomorrow and of course, you will see Annie’s dog, “Sandy” at the shows! Be sure to come support the kids of the Music Dept. and enjoy the RHS take on this classic. Tickets can be purchased for $7 at any of the RPS schools or by using freshtix.com/events/annie-. Many classes have come and gone since Rockland High School’s last 10 year accreditation in 2011 when today’s high schoolers were still in elementary school. This year RHS is meticulously going through the initial steps leading up to being re-accredited in 2021. 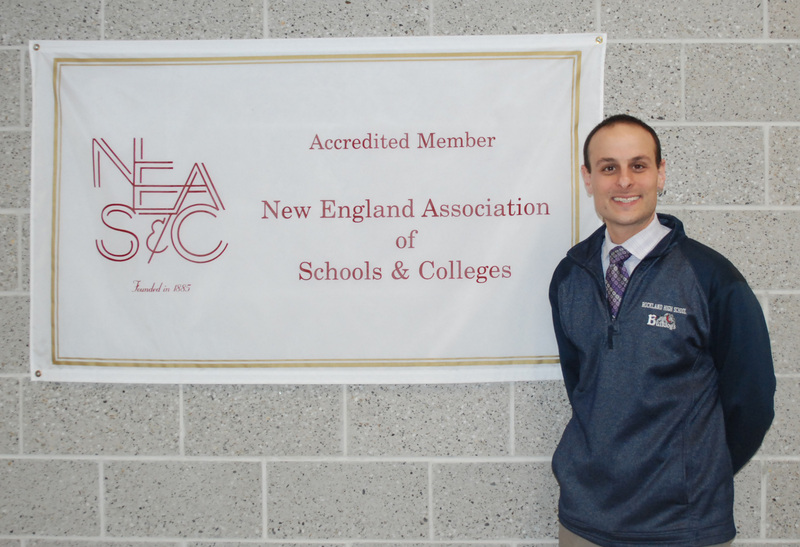 To accredit a school the New England Association of Schools and Colleges (NEASC) sets up a painstaking process of self-reflection and evaluation for the school community. The re-accreditation process takes place every 10 years although the process begins every 8 years after being accredited. This 8 year mark acts as a preliminary assessment of the school and reassesses the goals set from prior accreditation. In the end, RHS will reach the end of this cycle’s accreditation process in 2021. Taking the lead of the 2019 re-accreditation process has been social studies department head, Richard MacAllister, social studies teacher, Gregory Rowe, and RHS Principal, Dr. John Harrison. 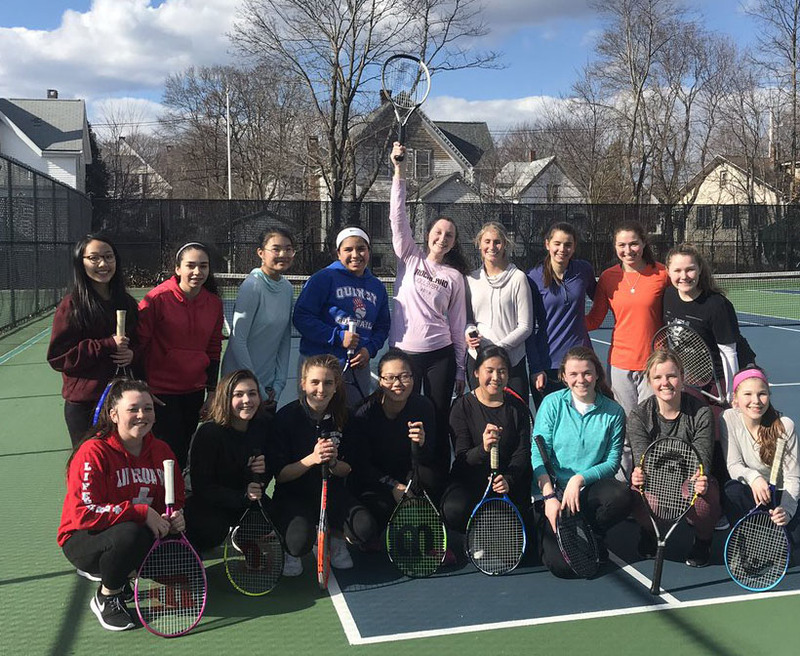 Together they have worked to set up guidelines based on NEASC protocols, and to organize the self-evaluations conducted by teachers and staff throughout the school. Through the school year, teachers, staff and some students have been busy preparing for the intense process of re-accreditation. During the year-long process, the staff has been looking at the school’s strengths and weaknesses and discussing how best to ensure our students are well equipped for life after RHS. This information is a part of the school’s self-analysis that will be presented to the NEASC visiting team. NEASC officials will be visiting RHS next week on March 28 and 29 for a Collaborative Conference. For the students, this means certain ones will be leading officials on tours of the facilities. On the tours, students will be guiding the officials around the halls of RHS pointing out all the features that make RHS unique.The NEASC officials will also ask questions along the way regarding the effectiveness of the school environment, compliance with local fire, police, and safety regulations as well as the cleanliness of the building. Students have also been selected to participate on a panel where officials will ask them questions regarding the school environment. Mr. Rowe explains, “NEASC is looking forward to talking to students to find out what they feel are the strengths and weaknesses of Rockland High School.” Here, they can better assess what goals need to be set and what needs to be prioritized for the 2021 accreditation. To complete this process teachers have been asked to provide samples of student work. Mr. Rowe continues, “They are looking for what kinds of exemplar work the students of Rockland produce.” Additionally, selected teachers, administrators, parents and community members have been selected, like students, to participate in panel meetings with the NEASC officials. On the day the four NEASC representatives arrive, they will be served lunch by RHS’s Pathways Grille. Every Thursday teachers are given the option to buy lunch from the cooks of the Pathways classroom: so, on the Thursday of the visit, NEASC officials will receive a meal as well. For more information on the accreditation process, go to the Rockland Public Schools website.